More than 20,000 people will die today from common childhood illnesses, malaria, tuberculosis, AIDS and complications of childbirth. Many would still be alive if the carer or health worker had access to reliable healthcare information. "All of us - rich and poor, governments, companies and individuals - share the responsibility of ensuring that everyone has access to information, means of prevention and treatment." Global Healthcare Information Network CIC (GHI-net) is a non-profit organisation established in 2005 to administer the global initiative HIFA (Healthcare Information For All). HIFA was launched in 2006 in Mombasa, Kenya, at the biennial congress of the Association for Health Information and Libraries in Africa. HIFA helps to ensure that health professionals and citizens are aware of, and have access to, appropriate and reliable healthcare information from authoritative information providers such as the World Health Organization (WHO). This in turn helps them to provide evidence-based health care for those in need. HIFA continues to grow, with more than 15,000 members in 175 countries, and is supported by more than 270 health and development organisations worldwide, including the WHO (main strategic partner) and the British Medical Association (main funder). 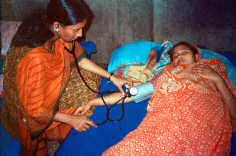 Healthcare Information For All (HIFA) emerged from a review commissioned by the World Health Organization . A short version of the review was published in 2004 in The Lancet . Copyright © 2009-2016 Global Healthcare Information Network.